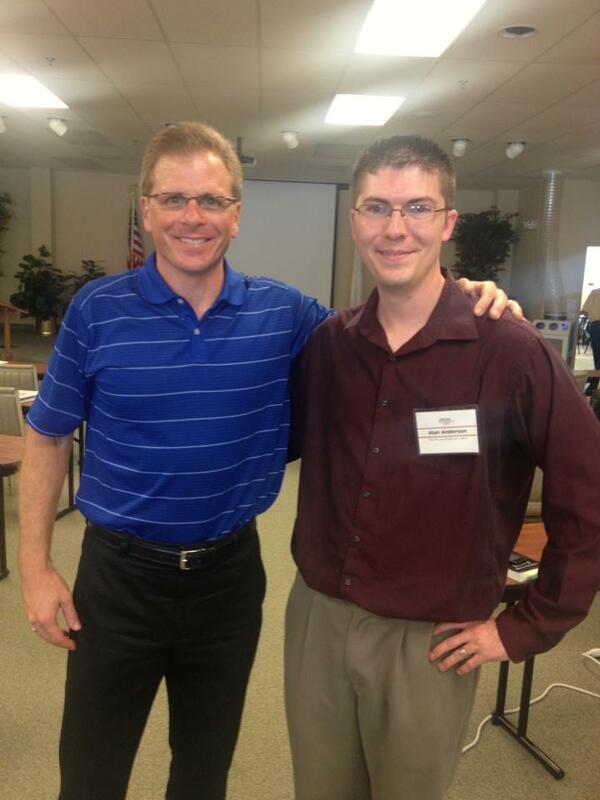 I had the genuine pleasure of meeting Frank Turek at his three day Cross Examined Instructor Academy (CIA) class at Southern Evangelical Seminary in 2013. In the months that led up to CIA, I carefully read I Don’t Have Enough Faith to be an Atheist by Frank Turek and Norman Giesler, which I absolutely loved. Frank (along with Norm obviously) has a way of distilling complicated topics to a lay level for easier comprehension and readability. His delivery is witty and entertaining and allows for his audience to grasp the message in a practical way that promotes a competent understanding of the material. Needless to say, I consider Frank to be a mentor from afar in my apologetic studies. He has guided me via his books and his Cross Examined organization. “When we built an addition to our house, I was amazed how many specialists were needed. After the foundation guy, a series of specialty contractors came in. I can’t remember the exact order, but we had the framing guy, the roof guy, the brick guy, the siding guy, the window guy, the electrical guy, the plumbing guy, the insulation guy, the heating/AC guy, the drywall guy, the trim guy, the floor guy, the tile guy, the light guy, the fireplace guy, the paint guy, and an inspector. Frank dives deep into each of these topics that atheists futilely use against God’s existence. Ultimately, if objections to theism necessarily require that theism be true for those objections to make sense, atheism might want to forego its critique on theism. Frank supports the claim that atheists are ‘stealing from God’ when they make assumptions about the world that can only make sense in a world where God exists. I would highly recommend everyone (believer and unbeliever alike) read this book. Frank is able to keep complicated topics simple and provides helpful examples throughout the book to illustrate his points. He doesn’t allow his intellect to obstruct his ability to prioritize the importance of clearly delivering the message of the book. Being widely read in the area of Christian apologetics myself, I’ve never read a book solely dedicated to this topic. While I’ve read many books that refer to the harsh realities of atheism, I’ve never heard of (before now) an entire book dedicated to this topic. It’s a brilliant idea! Being familiar with Frank’s work for years, I’m not surprised that he wrote a book on the topic because he’s always referring to C.R.I.M.E.S. in the way he addresses these topics when he speaks and writes. For me, this is the most practical Christian apologetics book since J Warner Wallace’s Cold Case Christianity. A word to unbelievers, this is a book you must read. It will rightfully challenge your worldview and hopefully push you to reconsider your atheistic presuppositions. This is a challenge that must be faced with honesty and a genuine desire to embrace the truth. Frank outlines the logical consequences one must accept in order to be a loyal subscriber to atheism. These philosophical conclusions should prompt to you reexamine your belief that a God does not exist. I would encourage you to read the book with an attitude that allows you to freely follow the evidence wherever it leads rather than reading the book with a presupposition that the existence of God isn’t possible. Judge the book on its merits and you’ll gather a ton of valuable insights from it, and possibly a new worldview. A word to Christians, this book is a tremendous resource for you. It reveals the deficiencies of the atheistic worldview and presents a solid case for the Christian worldview (for the complete Christian apologetic, read I Don’t Have Enough Faith to be an Atheist). I strongly encourage you to become fluent in C.R.I.M.E.S. because it will help you become a better Christian apologist who is capable of having an informed discussion with unbelievers. This is a book that will generate discussion among believers and unbelievers alike. Frank is definitely capable of supporting his claims presented in this book in a public forum and I definitely look forward to potential debates in the future. It is people like Frank that do the intellectual hard-work for the church, and help One Dollar Apologists like myself deepen their understanding. Christian apologetics is vitally important for the expansion of the church in today’s secular society. These types of books are tools that help defuse the potency of atheistic claims against Christian theism. Equipped with the knowledge of this book, we’re better prepared to explain why atheism is false and easily point out the false assumptions atheism makes to articulate its case. This book is a wonderful apologetics book that is uniquely capable of delivering a message about the inadequacy of atheism. Do you know if Frank interacts with Presuppositional apologetics? Frank is not a presuppositional apologist. From everything I can gather, he is a classical/evidential apologist. I hope that addresses your question. Christians believe that the bible and the teachngs they follow are true. Atheists wouldn’t be correct in their assumptions if God exists because atheism necessarily assumes that the existence of God is false. If theism is true, atheists would be “banking on” false conclusions because their assessment of theism would be objectively incorrect. The premise of this message is that C.R.I.M.E.S. (as detailed in the article and Turek’s book) adequately illustrates how atheists “steal from God” to make their case. I would strongly encourage you to read Turek’s book with an open mind and heart and follow the evidence where it leads. Thanks for taking the time to read and share your thoughts! And my Amazon wish list just got a little bit bigger. I can’t wait to read this one! Sigh…I guess I might read this book if I could find it in a library. I surely wouldn’t pay money for this type of asinine arrogance to be shoved down my throat. Are you truly ignorant of atheists, or do you just misrepresent us to make yourself feel better? You say this book will “push you to reconsider your atheistic presuppositions.” There may be some atheists out there who start with presuppositions, but I don’t know any. Most of them are ex-Christians, like me. We tried the faith. We believed in Jesus. We sought the holy spirit and pledged our lives to serve the Lord. Then we found out he wasn’t really there. We didn’t presuppose; we came up against evidence and decided not to ignore it. Of course God is technically “possible”; he just doesn’t seem to exist in the real world we all live in. Even Frank Turek admits that lots of Christian kids go off to college and become atheists. I’ll explain why none of those arguments are convincing to me if you’re interested. They’re the same arguments Turek and other apologists have been peddling this whole time. Apologetics books aren’t to convince skeptics; they are to make Christians who doubt feel confident to smother those doubts and hold on to their wavering faith. Respectfully, your response isn’t indicative of you being free from all presuppositions. Personally, in my experience as an Christian apologist, I have sadly found that most people aren’t overly charitable to the opposing worldview. People like Frank do acknowledge that young Christians are losing their faith in college, but that isn’t because the Christian faith is anti-intellectual. Our diagnosis is that the church isn’t doing their job in training their young adults how to communicate the intellectual side of Christianity. I’ve personally spent time learning under Frank, and he is certainly not arrogant. I’d encourage you read his book objectively, and practice the open-mindedness that you’re championing in your comment to explore your understanding of the Christian worldview. You have nothing to lose! God bless Brother. Thanks for commenting.